Players should register here for the event. 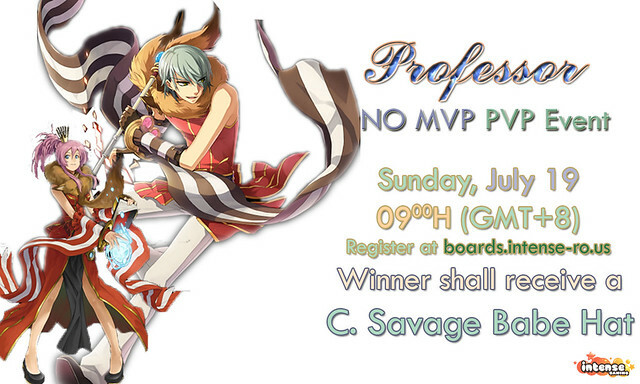 Registration thread will close on July 19, 0800H (GMT+8). Each individual may register only ONCE for this event. Dual Log-in or client shall not be allowed. All participants shall get as much Poring Coins as the battles that they have won. However, losing a battle shall lose them a coin as well. Prize for the winner is 1 Costume Savage Babe Hat and his accumulated number of Poring Coins. Spectators shall be allowed for this event. Spectators are expected to be in Hugel (@go Hugel or @go 22) by 0845H. Spectators are expected to be nice during the event. Killing other people in the spectators' area will have them kicked out of the event map.